In this brilliantly conceived critique, two of the country’s leading constitutional scholars argue that the Bush administration’s preemptive approach to domestic and international security has not only compromised our character but has in fact made us more vulnerable to future terrorist attacks. 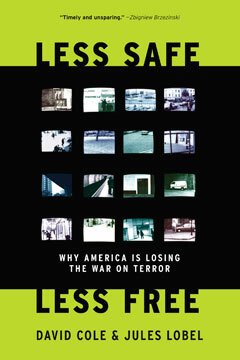 In a groundbreaking analysis of efforts employed in the name of protecting its citizens—preventive detention, coercive interrogation, pretextual prosecutions, registration of Arab and Muslim men, and preventive war—law professors David Cole and Jules Lobel expose the government’s abysmal record of failed prosecutions and empty successes. The authors argue that these results, when coupled with the resentment such coercive tactics have engendered throughout the world, have left us less safe than we would be had we employed a more sensible and less controversial preventive strategy. The book concludes by proposing an alternative preventive strategy to guide us into the future. Already standard reading for those who question the idea that “war” is the appropriate response to terrorism, Less Safe, Less Free offers an eloquent and original argument for a return to the rule of law. Jules Lobel is the Bessie McKee Walthour Endowed Chair at the University of Pittsburgh School of Law, a constitutional lawyer, and an expert on emergency powers and the laws governing war. He lives in Pittsburgh, Pennsylvania.